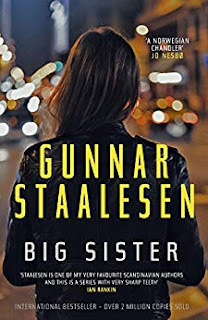 Amon the originators of nordic noir, Gunnar Staalesen has not fared as well as some others in being translated into English. His ground-breaking Varg Veum series includes 19 novels, published at regular intervals since the '70s in his native Norwegian, but only 9 have been translated for English-speaking readers, sometimes with gaps of 8 or 9 years between translations. Varg Veum is distinctive in a number of ways, perhaps not least because he is, to my knowledge, the only fictional private detective whose background is social work. And the novels frequently involve threatened children (as do, directly or indirectly, the two most recently translated). Plus Veum is ageing, closely tracking real time. By the second of the two new books he's 61, and showing the physical strains and limitations of his age (including slower recovery from the beatings that private detectives in noir fiction seem prone to get). In Wolves in the Dark, Veum has been struggling with the sudden death of his lover. He has mostly been a more or less upright citizen, though living at the margins of Norwegian culture in his home town of Bergen, but in Wolves, he. has plummeted down and out . He had indulged in acquavit to the extent of experiencing numerous total blackouts, and his detective work has suffered. Now, in the frame of the novel, he has begun his recovery, largely through the help of a new relationship, but he stands accused of a terrible crime and must revisit some cases he had taken on in his drunken days to look for who might have framed him. These cases, and his own flight from the police back and forth across Bergen, are a civic and cultural portrait as well as a very complex story (whose various threads are finally more or less drawn together by the end). His flight from the police adds a breathless quality to the narrative which is not typical for this series (though there are always passages of danger and threat in the books). Big Sister is a quite different story. Now that he is back on his feet, Veum is surprised by his new client, a long-lost half-sister, whose existence he was aware of but whom he has never met. She wants him to find her missing god-daughter, a college-age woman who has vanished. Veum dives deeply into several cases of sexual and physical abuse as well as drugs, plus unexpected strands of his own family history, as the book moves slowly toward a final surprise that seems a bit cinematic. 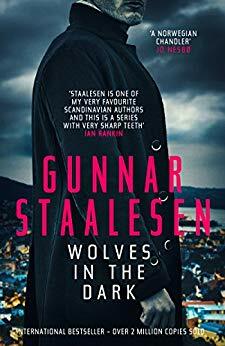 Along the way, he has to contend with a biker gang (bikers are a particular staple of Scandinavian crime fiction) and a host of reluctant witnesses. Veum's voice as narrator of his own stories is unfailingly self-aware, and grounded in both ethical standards and genuine concern for children and young people. 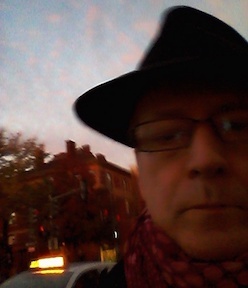 His unique voice is one of Staalesen's major conributions to Scandinavian noir. 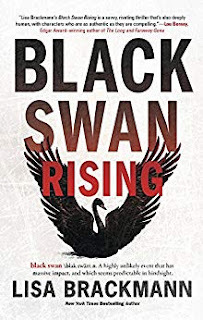 It says right on the cover that a black swan is "A highly unlikely event that has massive impact, and which seems predictable in hindshght," and Lisa Brackmann's new Black Swan Rising illustrates the idea in detail. the novel is part political thriller and part cautionary tale (of the dystopian sort), part "ripped from the headlines" and part vision of the near future. There are two central characters: first, Sarah Price, who has assumed a new identity to escape on-line harassment in her past and is now working as an intern for a congressman from San Diego who is running for reelection. The second is Casey Chang, a TV reporter who was the victim of a mass shooting and is trying to reestablish her life and her career. The novel alaternates betwee the two threats, shooters in real life and haters on-line. and sets out the real and fictional threats from both arenas vividly, not only in the threats against the two leading women, but also against the electoral system and the society as a whole. This is a thriller that hits much closer to home than the average book in the genre: what is happening is not only credible, but as the book's title suggests, inevitable in the current political and social toxicity. The on-line threats described are simply reflections of what is happening in the cybersphere every day, every minute. The active shooter threat is an extension of what we see every day (in schools and on the streets and specifically in the social movements brought out into the light by the encouragement of our current political leadership--and we shoudl remind ourselves that it's not a single person who has encouraged these hate groups now, it's a large segment of the right both in power and around the country. But Brackmann's novel isn't only dark and foreboding, it's also human and humane. The characters take us along this difficult journey through their compelling personal engagement with what's going on. And the action of the novel doesn't indulge in the cliches of the genre: The twists and turns of the plot are uniquely Brackmann's. Brackmann's previous two series, one set in the gaming and art worlds of China, the other a more straightforward pair of noir novels set in the drug trade of Mexico, the southern and western U.S., establish the writer's conversational narrative voice, which continues in Black Swan, but the new novel has more urgency and more contemporary impact, as if this is a novel that Brackmann had to write. I don't know of any other book that captures the actual social and cyber threats to democracy in the U.S. so effectively. We can hope for more, whether a sequel or a new angle on our times in future books. I was a big fan of the Maj Sjowall/Per Wahlöö Martin Beck novels when they were first translated in the 1970s in the U.S., and at the time my favorite was The Locked Room, the 8th of the 10 books. 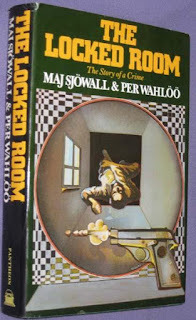 I had reread all of them a few years ago, but recently had occasion to listen to the audio version of The Locked Room recently and was surprised how funny it is (at least when listened to)--sometimes int he ironic way that all the Martin Beck books are funny, but also in a broad comic way. This is one of the most tendentious books in the series, in terms of its indictment of the Swedish so-called "welfare state" of the time, with the narrator occasionally veering into invective against the injustice and neglect that elsehwere is effectively potrahed in the crimes, victims, and even criminals (sometimes) in the series. The set-up is straightforward: A woman proceeds toward a bank in Stockholm, robs it, and kills a bystander almost by accident. The reader will not revisit this bank-robber until very late in the novel, though the police will focus on a couple of other bnnk-robbers at length. Afte rthe robbery, we turn to the return of Martin Beck to active duty, after the senior detective of the national homicide squad had been shot in the previous novel (Man on the Roof, very effectively filmed by famed Swedish director Bo Widerberg in 1976--inientally, The Locked Room was not included in the excellent Swedish series based on the Martin Beck books, only appearing on film in the '90s in the German film Beck: De Gesloten Kamer). Beck is assigned what everyone thinks is a lost-cause cold case, to give him something to do: A classic locked-rom murder (everyone except Beck thinks it's funny that Beck, who never reads crime fiction, has been assigned such a classic mystery novel premise). At the same time, the rest of his squad is investigating the bank robbery from the novel's first pages, but they pursue the notion that a gang of robbers that they have previously been unable to catch (but whose identities they well know) perpetrated this crime as well. One of the results of their pursuit is the spectacularly failed raid on the gang's hideout, a comic catastrophe that is more Keystone Kops than police procedural. When the solution to both crimes finally arrives, the criminals don't exactly come to justice, at least not in any conventional manner. But the novel's conclusion is satisfying in several ways: in its ironies, in its endorsemenet of the lives of those at the bottom of Swedish society, and in the private life of the usually doleful Beck. In the end, this is no longer my favorite Beck novel (perhaps The Fire Engine That Disappeared currently holds that title), but is a reminder of the very high standard that this series set for crime fiction in Scandinavia, and indeed everywhere else.